We don’t often cover Broadway shows since CultureSonar’s friends live across the country and around the world. But every now and again The Great White Way offers something so special that it’ll interest everyone. Natasha, Pierre and The Great Comet of 1812 fits that bill. Let’s start with the musical’s star: Josh Groban, probably not prominent in your playlists but nonetheless having sold more than 25 million albums worldwide by age 35, in the neighborhood of Kiss (27 million) and Aretha Franklin (24.7 million). With a beautiful, expressive, category-defying range, he’s a confident purveyor of love songs and ballads, a worthy heir to Andrea Bocelli (he made his debut subbing for an ill Bocelli in rehearsals for the 1998 Grammy Awards). 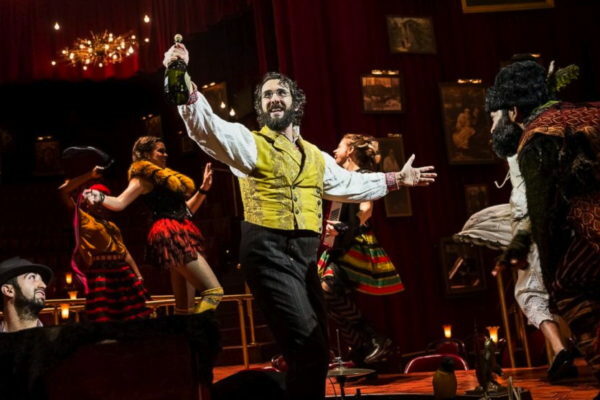 In another debut, this is Groban’s first Broadway appearance. But art transforms. And roles transform artists. Natasha, Pierre and The Great Comet of 1812 is an extraordinary experience from the first moment you enter the Imperial Theatre, which has been completely renovated (top to bottom) as a velvet-curtained, candle-lit cabaret or opera house from the Russian Imperial period. Actors, dancers and musicians chase up and down runways thrust into the orchestra and up the stairs to the mezzanine while the stage itself seats 150 audience members right in the middle of the action. Drawn from a snippet of War and Peace, the plot is as simple as it gets, a love story with conventional diversions into jealousy, faithlessness, drinking and treachery. But the performers shine and the voices – from the entire cast but especially those of Groban and Broadway newcomer Denée Benton – rise to the challenge of a musical entirely sung-through, operetta-style. Malloy takes no easy paths and although there’s redemption of sorts at the play’s conclusion, it’s as wistful and uncertain as it is revealing when, in a brilliant bit of staging, the comet – both physical reality and metaphor – mounts into the cold Russian sky. With Groban and Benton providing the emotional bedrock, director Rachel Chavkin explodes the story in dozens of entertaining directions. Comedic connivers, true-blue friends and a Moscow society shivering at the prospect of Napoleon’s imminent siege spring entertainingly to life in wild dances and musical styles ranging from a hip-hop debate worthy of Hamilton to the debauchery of a strobe-lit 19th century dance club shaking with house music. The bring-down-the-house number is a raucously traditional Russian barynya, lighting up a rural public house with dancing as wild as its kicking-and-stomping music and supplemented by egg-shaped castanets tossed to the audience to shake out the spirits of the night. Here’s the bottom line: Forget everything you thought you knew about Josh Groban. Don’t miss The Great Comet. The depth of Groban’s performance, his demanding wrestling match with fate, faith and love, is moving and uplifting. And the exceptionally inventive theatricality of the entire production will end your evening with an appreciative ‘wow’ for Broadway at its best. PS. Read more about a top-notch TV adaptation of Leo Tolstoy’s classic in our post Better than the Cliffs Notes: “War and Peace” on Cable. And for more on the Broadway phenomenon Hamilton, check out On Having a #Hamilcrush at 40. PPS. Please note: Josh Groban is no longer in the production which is slated to close on Sep. 3, 2017. Josh Groban is not a tenor. He is a baritone and he has sold more than 25 million! Hi Brenda, I read the article three times trying to figure out who your comment was directed at. I don’t see where it mentioned Josh was a tenor and they certainly pointed out that he has sold more than 25 million. Just curious.